Never before have the convictions of the Blue Collar philosophy become more meaningful as they have this past week with the arrest of Bernie Madoff for what may become the biggest fraud in the history of Wall Street. Madoff, now being called “the Thief of Wall Street”, engineered a $50 billion ponzi scheme that has had a rivetting impact on families and charities from Palm Beach Florida to Europe and beyond. How could this have happened, how could it have been avoided, and what are the lessons learned? 1- The broker-dealer section which traded stocks for their own accounts. This part of the business has not been implicated in any wrong-doing. 2- The money management section where he oversaw tens of billions of dollars of client assets and where he ran his ponzi scheme. Named after Charles Ponzi wherein money is taken from new investors to pay off longer term investors. Charles did his scam by touting a postage stamp that could be used anywhere in the world. He guaranteed investors to return double their money in 90 days. As new money poured in, the former group of investors were paid off and the scam snowballed. In much the same way, Madoff claimed consistent returns of 12% annually in any and all market conditions. He paid off investors with the tremendous flow of new money coming into his firm. This worked great for many years until the market hit its current downturn and people started pulling out of the market and no new money flowed in. The gig was up! How did he claim to accomplish these returns? He used what is called a split strike conversion strategy which is a fancy term for an option collar: He buys a stock from the S&P 100 (like Coke or AT&T), then sells a call option and buys a put option on that stock. This is vaguely similiar to what we do except he also buys a put (like getting insurance but lowering potential profit). This strategy works in an uptrending market but old Bernie claimed success in all market conditions. His trading was non-transparent and never checked by the regulators because everybody trusted Madoff. In 1999, Frank Casey, Fortune USA President, along with his fund managers ran a “dummy portfolio” using the split strike conversion strategy. He came to the conclusion that the claimed results were fraudulent and reported this to the SEC in 2000, 2002, 2005, and April of 2008! He backed these allegations with the fact that the volume of options traded could NOT possibly support the claims Madoff made of buying and selling options on tens of billions of dollars of S&P 100 stock. He also complained about the lack of transparency in Madoff’s portfolio. One of Casey’s associates wrote to the SEC: “The SEC should burn in hell for allowing this to blossom from a $10 billion ponzi scheme in 1999 to $50 billion one today”. The SEC missed many red flags. First of all, Madoff had an impeccable reputation. Many former SEC officers become part of Wall Street. Arthur Levit, former SEC Chairman even asked Madoff to help develop policy for the SEC! How could anyone doubt this man? Furthermore, SEC resources are limited and cases need to be prioritized. They tend to focus on high risk investments like derrivative trading, not the more conservative system of Madoff (or so it seemed). Christopher Cox (this man is toast! ), the current SEC Chairman admits shock over the lack of follow-up with regards to the allegations made from 1999 to the present. This is the really sad part. So many hard working people trusted their life savings to this monster/sociopath. Members of the rich and famous set like Steven Spielberg, Frank Lautenberg, Mort Zuckerman, and many of their charities all got hooked in. In addition, many pension funds gave a bulk of their cash for Madoff to invest for them. Outside the USA, institutions such as the Royal bank of Scotland and the Korea Life Insurance Company were also severely impacted. First we learned that we could not trust AIG, then Lehman, now this. Who can we trust? How do our global financial partners feel about regulation in this country? Many people have been effected and may not know it yet. Those who invested in Fund of Funds may have had money held by Madoff. These funds use as an investment strategy investing in other funds rather than investing directly themselves. Many of these Fund of Funds gave a bulk of their money to Madoff and their investors will feel the loss as well. Everyone who knows Bernie Madoff is shocked. Wall Street, the SEC, stockbrokers, friends, relatives, you name it. Where does that leave us, the average Blue Collar Investor? How can we figure out who to trust if all these people can’t? We can’t either! This is probably a whole article unto itself. Suffice it to say that it probably is some combination of lack of education (I know nothing about the stock market), laziness (I just can’t take the time), and greed (It doesn’t sound reasonable but I’m in!). Most of all it takes a brilliant mind tarnished with sociopathic tendancies. Look at all the good people this man hurt. By becoming CEO of your own money we would never entrust all our money to one person. We don’t care about reputation only what makes common sense. Even if we did give some of our hard-earned money to Madoff for his crime spree, it would have been a small portion because diversification is so important in our investment portfolio. We would never, ever give all our money to one guy! I believe in diversifying asset classes, stocks, and cash. If you get hurt in one area the others can pick you up. I’m all for mastering a particular strategy, after all that’s what I do when I sell covered call options. My son, Craig, gave me a great analogy in this regard: He calls it “learning the move”. When he was in high school, Sega Genesis was in vogue. He played an ice-hockey nintendo game where you would take the puck in on the backhand and then as you approached the goalie, switch to the forehand and you could score on anybody. He learned the move and was successful most of the time. Our move is selling covered calls or whatever move you choose. It is much more prudent to learn the move than to fall victim to the Bernie Madoffs of the world. 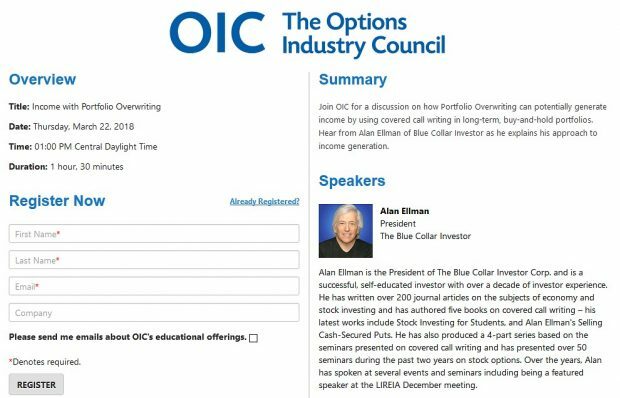 Hello all Blue Collar Investors! On December 11th Jim Cramer had the CEO of Panera Bread (PNRA), Ronald Shaich, on his show.He told Cramer that despite a tough 2008, Panera Bread is up 34 %.Comp sales have been in positive territory for the first three quarters and said this quarter will be the same.Earnings are expected to jump between 46 % and 54 %.“We’re not walking away from that guidance”, Shaich said. Panera’s also sitting on $31 million in cash and should generate $ 70 million in free cash flow next year.That’s a great cushion to get through this recession, but Shaich is focused on growth.“A recession is probably the greatest opportunity you can have”, the CEO said, “to build a company and to build a fortune.”This sounds to me like this CEO has tremendous faith in his company! If we were to sell an option in a normal market we could sell the Jan $55 call @ $3.20 for a 1-month 5.9% return OR (more conservatively) sell the Jan. $50 call @ $6.30 for a 3.3% 1-month return with a phenominal 8.5% downside protection! On Tuesday, the Federal Reserve Board announced that it would lower the federal funds target rate from 1% to a range of 0% to 0.25%. It also indicated its willingness to purchase mortage-backed and Treasury securities. This sparked a market rally on tuesday wherein the S&P 500 rose 5.1%. Other news wasn’t as positive. The Consumer Price Index (CPI) had its largest monthly drop ever, indicative of the depth of the recession we are experiencing. Steep declines in housing starts and industrial production also added to the negativity. For the week, the S&P 500 rose 0.9% for a year-to-date return of -38.15%. I really hate ending my articles on bleak economic news sooooooo…..the Yankee signed Sabathia and Burnett so their pitching staff is looking really strong for 2009! Use the “comments” link from this article to add your opinions and suggestions. Those of you who follow the CBOE Volatility Index (VIX) as a parameter for determining market tone, may have noticed a major shift. In late October the VIX hit a high of 90. Today it sits @ 43. This is a major positive as it implies less risk as the market begins to settle . Numbers above 30 are considered risky so we are still not where we want to be, but certainly in a lot better shape than 2 months ago. I will publish a chart of the VIX over the weekend. Months ago because of Buffets’s advice and in light of what i was watching happen in banking cirles with bailout money i moved major components of my portfolio into the Goverment Money Market, Vanguard bond Index and ING fixed…overall i am up 7.07% even with the market volotility which we have seen. Still diversivide according to the code I am seeing success. Looking at the numbers of some major banks this week and their billion dollar windfalls after the bailout i can only imagine what a rate of teturn similar to mine would have meant at the 20 billion dollar level.